After spending over 3 weeks in England for Christmas and New Year now I am back I really fancied something Spanish. I bought these HUGE prawns and decided to make this stew. It has chorizo in for a little smokiness, cannellini beans to fill out the dish, also I added chilli and a sprinkling of coriander for a Mexican twist. It was delicious, tasty and healthy. You can eat this with rice, crusty bread, quesadillas or just on its own, but I would definitely serve it with a glass of vino tinto. In a skillet or frying pan dry fry the chorizo until brown, this should give off enough oil for the next stage. 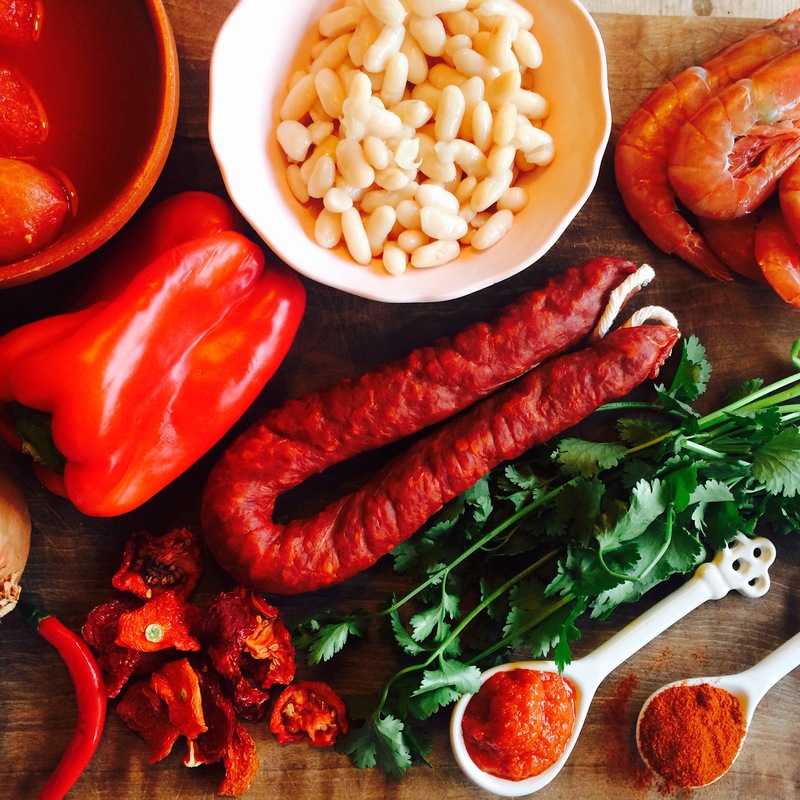 Remove the chorizo with a slotted spoon and set aside for later. Add the onions to the pan reduce the heat and soften. Add the sun-dried tomatoes and cook for a few minutes. Add the garlic, chilli and stir, then add the paprika. Now add the red pepper and mix well. Stir in the tomato frito or paste. Pour in the tin tomatoes, slightly crush them once in the pan leaving some chunky pieces, then add the sugar and balsamic. Empty in the beans. Pop the chorizo back in and mix well, sprinkle half of the coriander in and season. Once the flavour is to your liking, place the prawns over the stew. You can cover this with foil and continue cooking on the hob, I however placed these in a pre-heated oven at 200 degrees; uncovered. Cook for another 10 minutes ..ish, depending on the size of your prawns,, I turned the prawns over during this time. Once cooked sprinkle over a little more coriander and drizzle over some extra virgin olive oil! Cook for another 10 minutes ..ish, depending on the size of your prawns or cook until the prawns are pink and cooked, I turned the prawns over during this time.